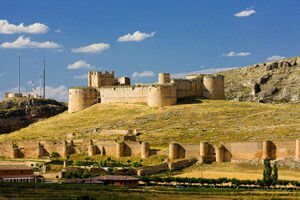 Berlanga de Duero Castle is another priceless monument of Spanish territory, reminiscent of the glorious past of this nation. This late medieval castle is located in the town of Berlanga de Duero, which is located in the province of Soria. This small historic town is 24 km from the village of El Burgo de Osma. Berlanga de Duero is still surrounded by medieval massive walls that are constructed by two round enclosures. The castle was built on a gradual declining slope, cut by a deep ravine. Together with fortresses Gormaz, Osma and San Esteban the fortification of Berlanga de Duero has formed one of the four "gateways" through which it was possible to invade Kostilya in the Middle Ages. Berlanga de Duero was a key fortress because it had provided communication through the River Duero. Berlanga de Duero Castle was conquered by Ferdinand I of Castile and Alfonso VI, after the invasion into Toledo. Perhaps the area around Berlanga de Duero was quite settled as in the 12th century there appears to have been mini societies which probably formed by the desire to defend their territories from enemy invasions of Aragon. During the Don Alvaro de Luna, the region was the scene of clashes between rival gangs of nobility. Then Charles V gives the stronghold of the duke of Frias in the 16th century. In 1527 the Duke began a large-scale reconstruction and repaired the damaged parts of the Berlanga de Duero Castle. At that time the castle had built beautiful gardens and its interior was unforgettable with luxurious furniture and expensive items. For a period of time hostages and the sons of French King Francis I were held within the castles dungeons. The current structure of the castle near the River Duero is a combination of individual buildings. Some of them are built with the foundations of the old Arab fortress, which was reinforced after the Christians won the world territories. The big oval in the square tower dates from the medieval period of building the fortress, although it was reconstructed later.